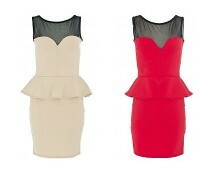 Peplum designs are seriously stylish choices right now and if you have not already introduced this trend into your style, then this bodycon midi version is an absolute must; it’s a perfect choice of dress that will suit almost all shapes and sizes and is ideal for work wear, evening wear or as a stylish summer dress! The design features a peplum waist that adds a touch of volume to create a gorgeous feminine silhouette; perfect for those who want to accentuate curves but also great for concealing larger bottoms as it helps to balance out body proportions. The short sleeves and classic length add class and sophistication, and the zip fastening ensures an easy snug fit! This Love Label dress is a blank canvas and can be easily styled in many different ways, sparkly shoes and clutches will spice it up for a night on the town, whilst a smart fitted jacket and simple heels will tone it down for a sophisticated work look.